When the vendor gave us the ASUS RT-N66U wireless router, he added a small beautiful device – ASUS EA-N66 that combines the functions of a wireless adaptor, an access point and a repeater. We found it quite interesting and decided to devote a whole review to EA-N66 that we here offer to our readers. 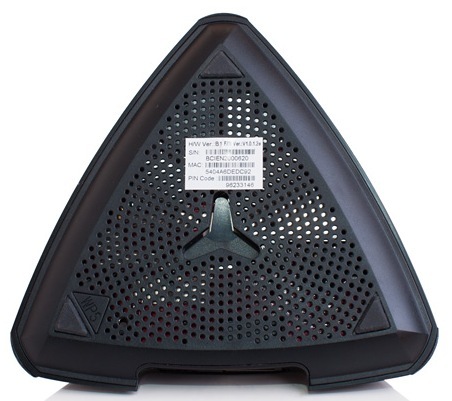 ASUS EA-N66 looks like a pyramid made of matte grey and shiny black plastic – a product of an alien civilization. Its dimensions are 122x111x62 mm and its mass is only 110 gr. For its operation ASUS EA-N66 requires a 12 V and 1 A external power adaptor. The inner bottom surface looks like water with a wave originating in the center. In the side walls there’re blue LEDs that make the device even more surrealistic. On one of the base sides there’s a Gigabit Ethernet interface and a slot for the power adaptor. Most part of the bottom is occupied by the ventilation grate. Also, here’re three rubber stands to put the device on the table. The sticker with brief information about the access point provides the user with everything he needs to know about it. ASUS EA-N66 can also be mounted on the wall for which there’s a Y-shaped technological hole in the center of the bottom. The sunk Reset and WPS buttons are also placed here. 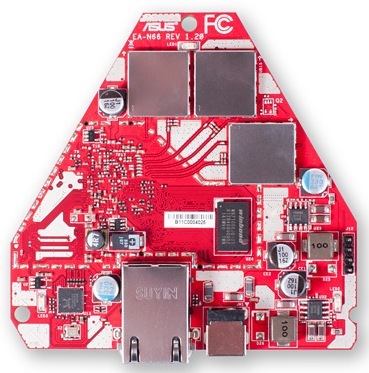 All electronic filling is placed on both sides of a red hexagonal board. Unfortunately, all interesting elements are covered with metal screens. The only things available are 128 Mbytes Winbond W971GG6JB-25 RAM, 8 Mbytes Macronix MX29LV640EBTI-70G flash-memory and a Realtek RTL8211E GE-controller. Now let’s study the device software component. Firmware upgrade can be performed from the web-interface with the help of the Firmware Upgrade tab in the Administration point. The upgrade procedure is not at all complicated and doesn’t require any special skills from the user – one only has to choose a file with a new firmware image and click on Upload. 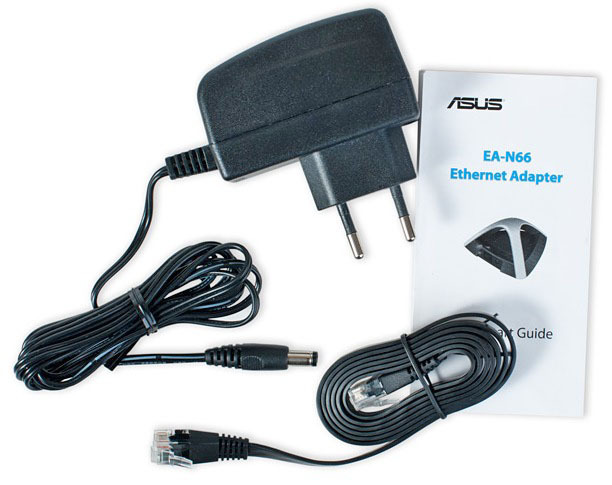 When the article was being written, there were no utilities for ASUS EA-N66 available on the vendor’s web-site. 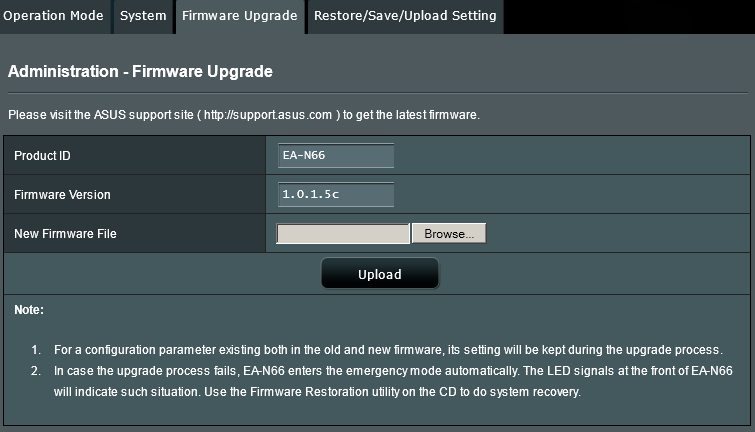 So, for firmware recovery in case of its unsuccessful upgrade we took the Firmware Restoration utility for the ASUS RT-N66U wireless router about which we’re going to talk very soon. In our view, it would be quite logical to provide ASUS EA-N66 with some minimum number of utilities with Firmware Restoration and Device Discovery among them. One can find out that EA-N66 is in the rescue mode if the LEDs are flashing slowly, or rather slowly changing their brightness. It’s also worth noting that the administrator can manually drive the device into the rescue mode by switching ASUS EA-N66 on with a pressed Reset button. Restoration goes correctly despite pop-up warnings regarding the firmware foreignness. After a successful restoration procedure ASUS EA-N66 boots in the regular mode and the Device Discovery utility from the same RT-N66U set detects it. We can’t but mention the option of fully manual firmware recovery. 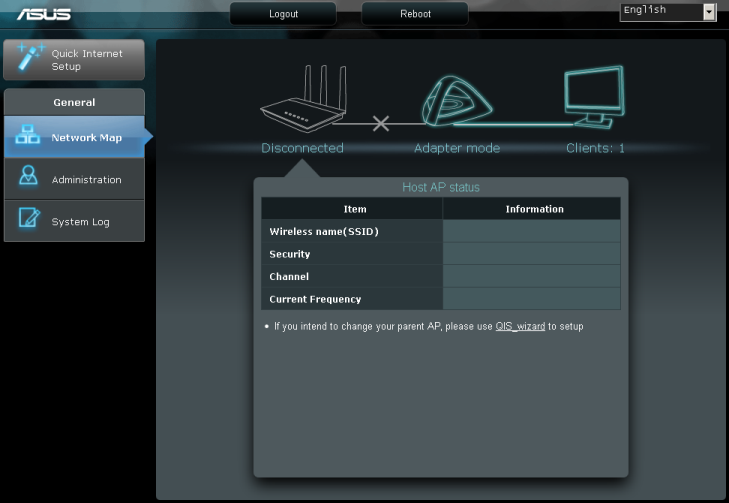 We directly connected to ASUS EA-N66 that was in the rescue mode and ran a Wireshark version 1.6.7 network analyzer. It determined that the device sends ARP-queries about 192.168.1.75 from 192.168.1.1. As our test machine had a different IP-address from the 192.168.1.0/24 subnet, our model at hand ignored all attempts to send a file via TFTP. 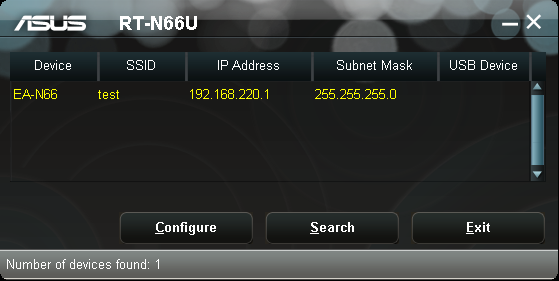 However, as soon as we set the IP-address on our test PC to 192.168.1.75, we were able to send a file with new firmware to EA-N66 via TFTP. 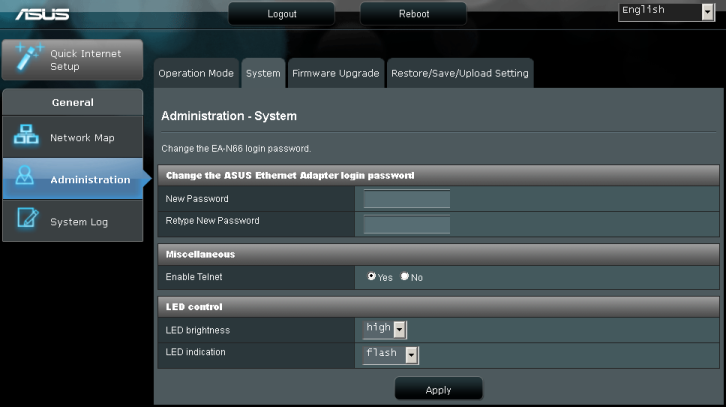 EA-N66 web-interface design is characteristic of ASUS-WRT firmware – it’s performed in dark colors and is available in eleven languages. 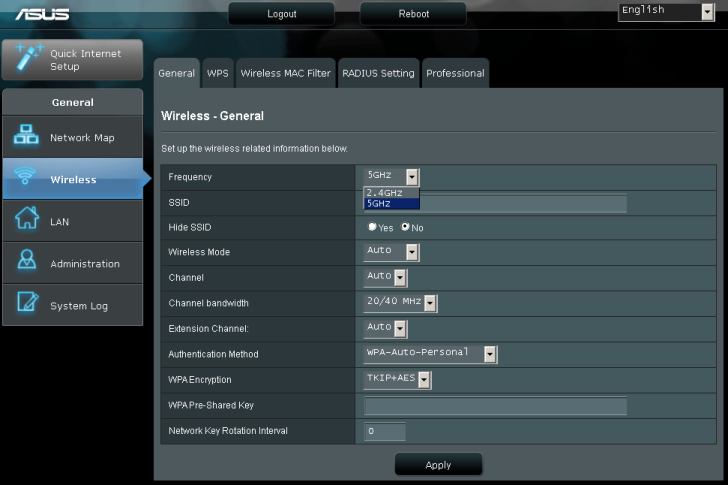 As the device web-interface in the wireless client mode has only a minimum number of settings we’re going to study all menu points. 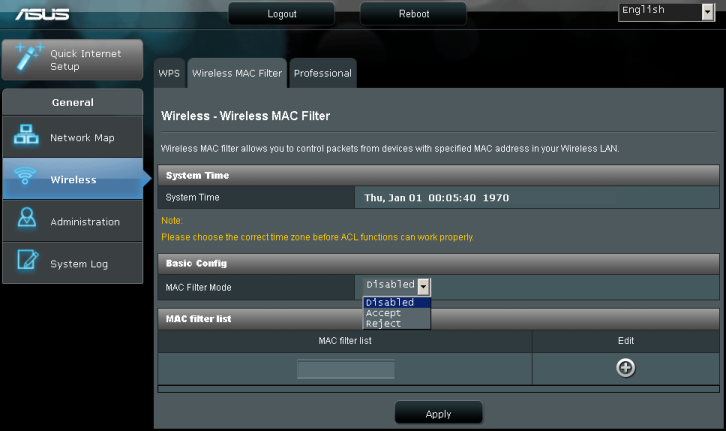 The Quick Internet Setup allows choosing the device operation mode and configuring essential connection settings. 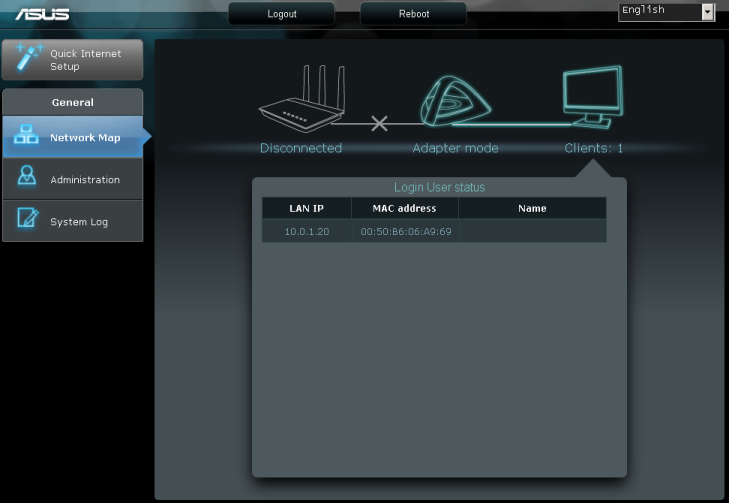 With the help of the Network Map item the administrator can get brief information about all network devices taking part in the connection. The tabs of the Administration menu give the user the ability to choose the device operation mode, change the password, turn on and off access via telnet, upgrade firmware as well as restore/save/upload user settings. We should also mention that EA-N66 allows managing LED indicators built into the case. 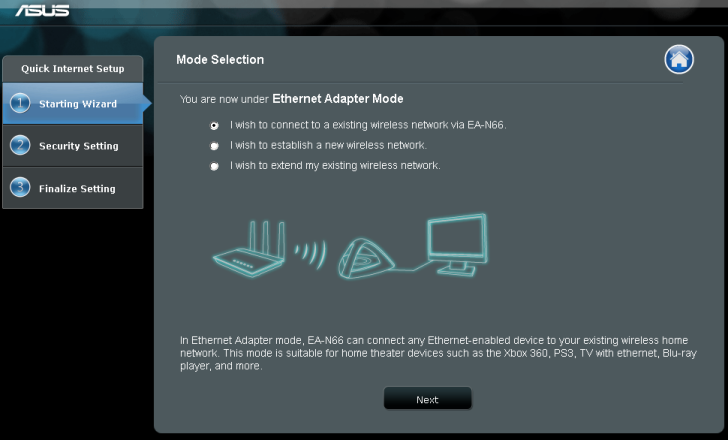 Actually, we think it strange that EA-N66 can’t work as a wireless router when the only wired port is connected to the provider and all user clients are wireless as we’ve already seen in ASUS WL-330N3G. 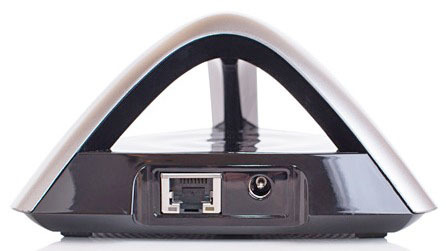 Perhaps, the device main purpose is to serve as a two-range repeater and client; as at the moment virtually all modern televisions have a LAN interface, with the help of EA-N66 it’s possible to establish a 5 GHz connection to a router that will provide maximum bandwidth enough for transmitting high quality media content. 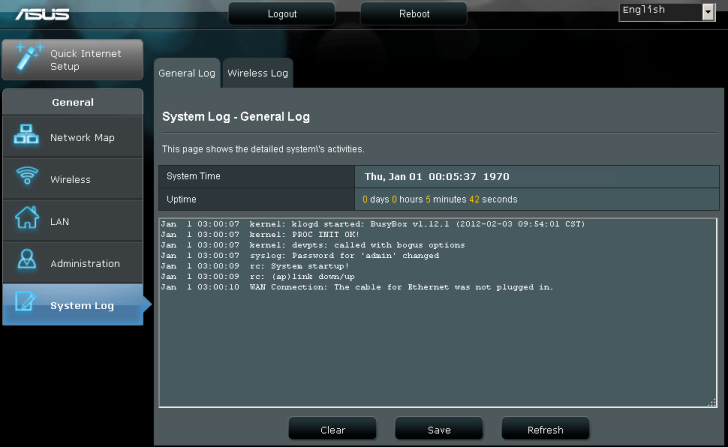 The System Log menu allows the administrator to study the device log data. To be fair, it’s worth noting that the number of items in the menu changes according to the chosen mode. 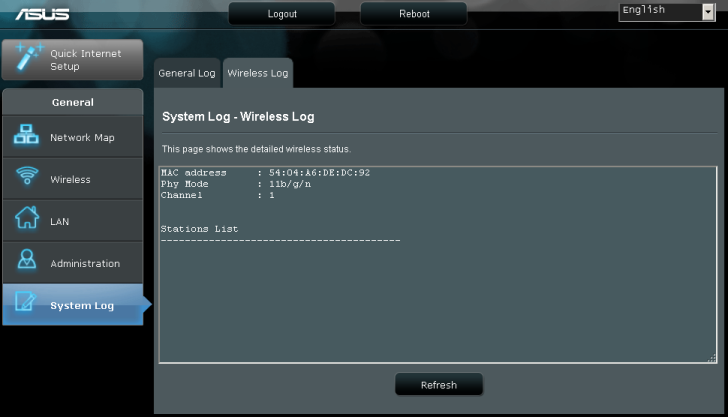 For instance, when EA-N66 works as an access point, a Wireless log tab appears in the System Log. 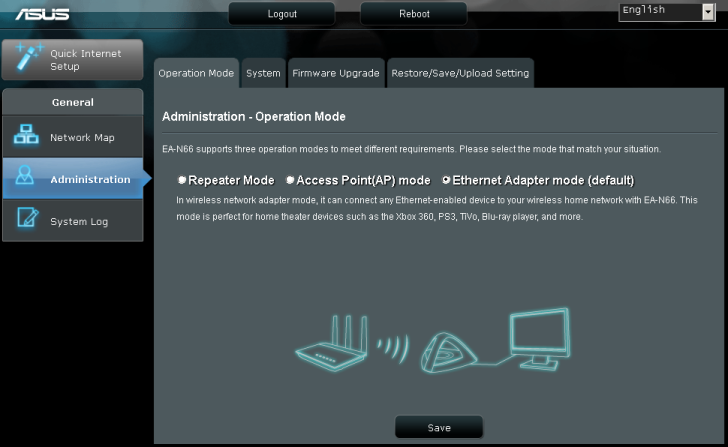 Besides the menu altering, the change of EA-N66 operation mode results in the change of the IP-address of the managing interface. Unfortunately, for this model the vendor’s site doesn’t provide any utility pack that could detect ASUS wireless devices in the local net. Luckily, the Device Discovery utility produced for other ASUS devices readily detects EA-N66 as well. 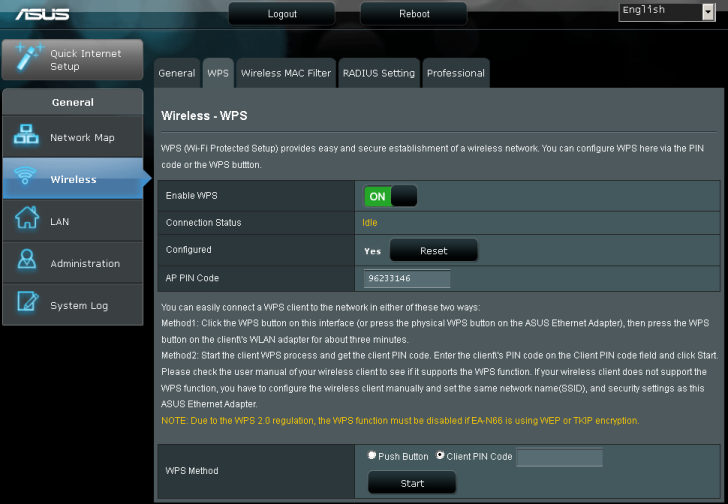 Turning in the repeater mode adds a Wireless item that allows managing the connection with the help of WPS, filtering MAC-addresses and specifying the transmitter power. Although the Wireless point is already present in the repeater mode, jumping into the access point mode gives more flexibility in changing the device wireless parameters. The same goes to the System tab in the Administration menu where additional features appeared as well. 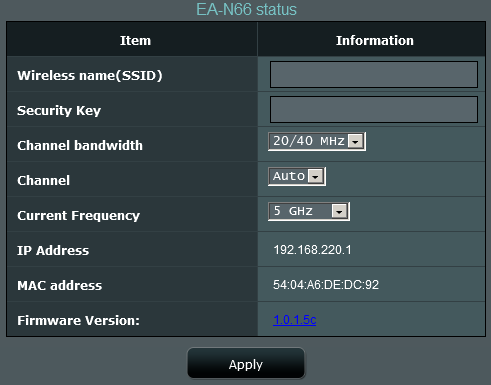 Although the vendor’s site claims that EA-N66 is an N900 wireless adaptor, in reality this device will be able to work only in one frequency range both as an adaptor and as an access point, i.e. to be an N450 device. 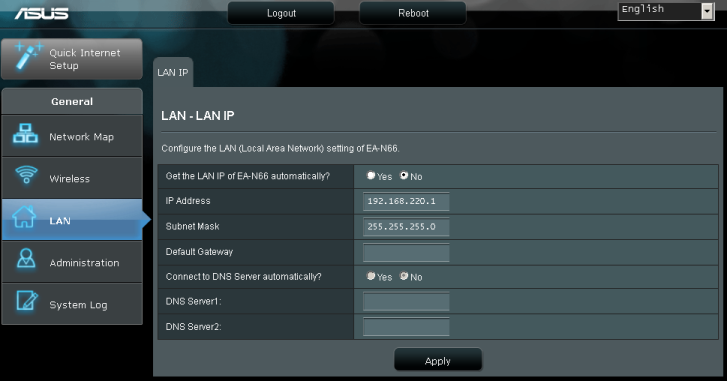 The LAN point allows the administrator to specify IP-parameters for the device wired interface. 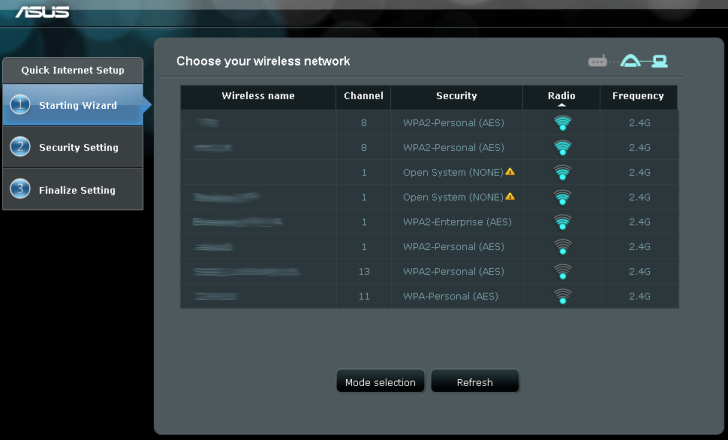 Unfortunately, ASUS EA-N66 can’t work with IPv6. Although we certainly understand that this device is going to be used exclusively as a bridge between the wired and wireless segments of an existing network, it’s not long before users will turn from IPv4 to using a next generation protocol completely. We would like to mention that after applying new settings ASUS EA-N66 reboots though in our view, sometimes it’s far from necessary. Here we’re through with the web-interface review and are moving on to studying the features of the command line. Command line interface access can be performed via System tab on the Administration menu. 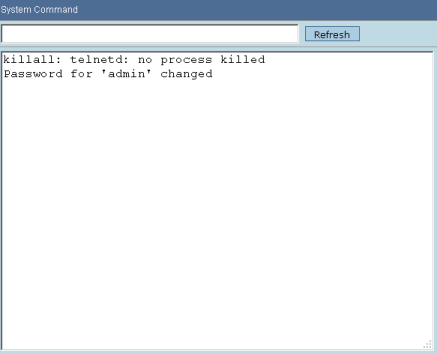 You can also use the hidden page Main_AdmStatus_Content.asp that allows making system calls and execute a command run_telnetd. To log in you will use the same login and password as for the web-interface (admin/admin by default). In such devices the use of the BusyBox library is traditional. With the help of the command ps let’s see what processes are running on the device at the moment. Let’s get into the contents of the catalogues /bin, /sbin, /usr/bin and /usr/sbin as well. The utility arpstorm that is responsible for sending APR-requests about all the addresses on the local net turned out to be interesting. Now let’s move to the catalogue /proc and find out what files are located here, and learn the operating system uptime and its average load, get the information about the CPU used and RAM capacity. To see the list of all supported file systems and types of encryption is possible from the files /proc/filesystems and /proc/crypto. Of course we couldn’t skip the ASUS devices traditional utility nvram, by means of which the user can look through the main settings of the system and change them. It’s time to finish our review of the command line interface abilities. The first traditional test is to detect the device booting time under which we mean the time interval between switching power on and receiving the first echo-reply via ICMP. ASUS EA-N66 boots within 36 seconds. We consider it a good result. Later on we checked the security of the device by means of Positive Technologies XSpider 7.7 (Demo build 3100) network security scanner. All in all we detected six open ports: TCP-23 (Telnet), TCP-53 (DNS), UDP-53 (DNS), TCP-80 (HTTP), TCP-9998 and TCP-18017 (HTTP). The most significant findings are displayed below. The main parameters of our testing stand are shown below. 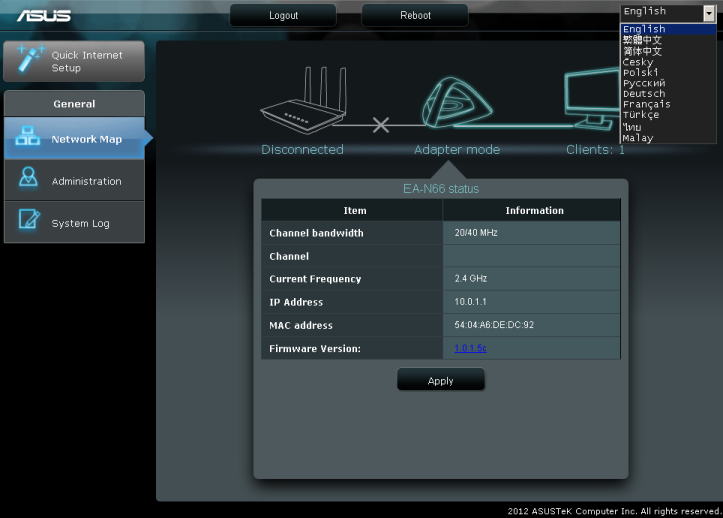 We decided to check the EA-N66 performance in two modes: a wireless client and an access point. In the first case we connected to the router ASUS RT-N66U, in the second one as a wireless NIC we used the model D-Link DWA-160. Unfortunately, we didn’t have one more EA-N66 to accomplish a full check of the device as an access point since although D-Link DWA-160 NIC supports the work in both frequency ranges, but the maximum supported transmission speed in theory is only 300 Mbit/s, while RT-N66U and EA-N66 support the speeds up to 450 Mbit/s in each of the ranges. That is why, in our opinion, the speeds shown by EA-N66 in the access point mode turned out to be far lower than the ones we managed to get working with EA-N66 in the wireless client mode. All the results are exhibited on the diagram below. In this test we used the utility JPerf version 2.0.2, the data transmission was realized in one, five and fifteen simultaneous TCP-sessions. This brings us to the end of the testing section. Let’s make conclusions. 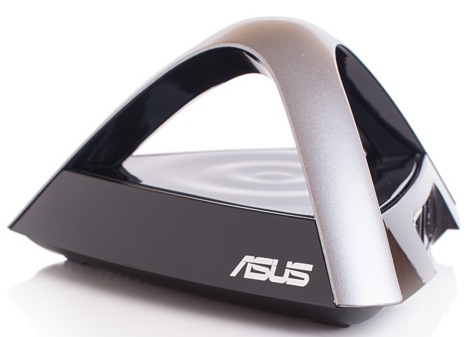 We liked the multifunctional wireless device ASUS EA-N66 mostly because of its unusual futuristic design – never before have we seen such a case shape and the demonstrated data transmission speeds. 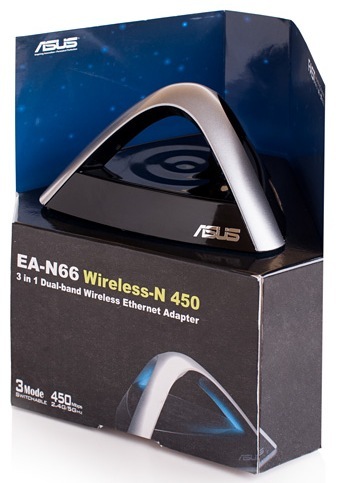 At the time of writing the article the wireless adapter ASUS EA-N66 hasn’t been officially sold in Russia yet, that is why by the time of its sales the vendor promises to have eliminated a range of insignificant drawbacks that are usual for product demo-version. We consider incomplete translation of the web-interface and incorrect Russian time zones to be one of such disadvantages. 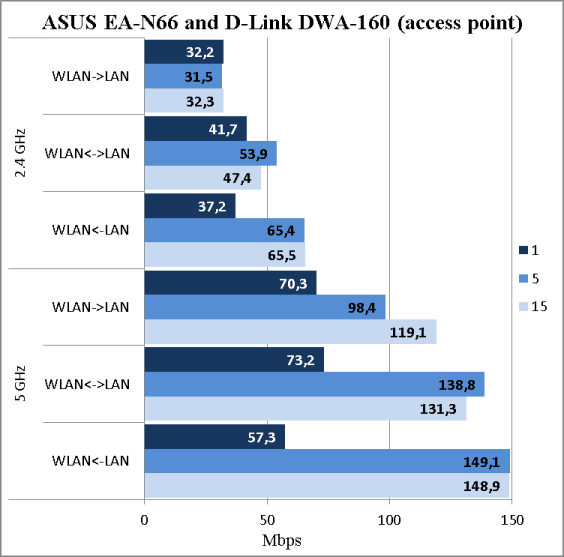 ASUS EA-N66 strong points are enumerated below. 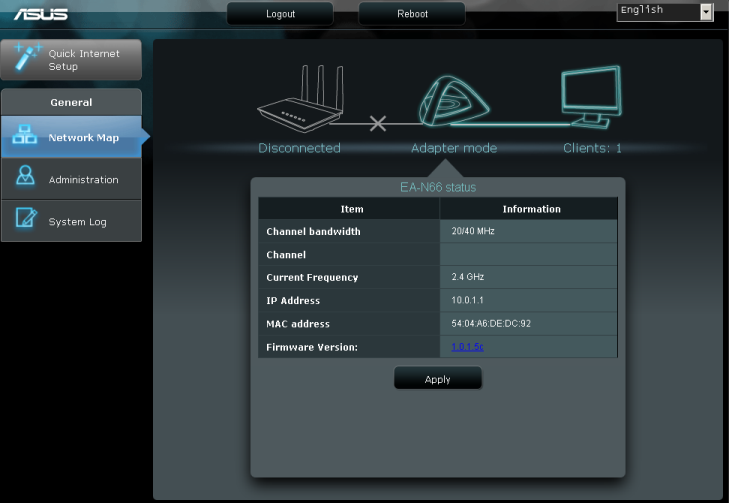 Dual-band (2.4 and 5 GHz) support. High speeds of data transmission. Unfortunately, we can’t help mentioning the drawbacks either. 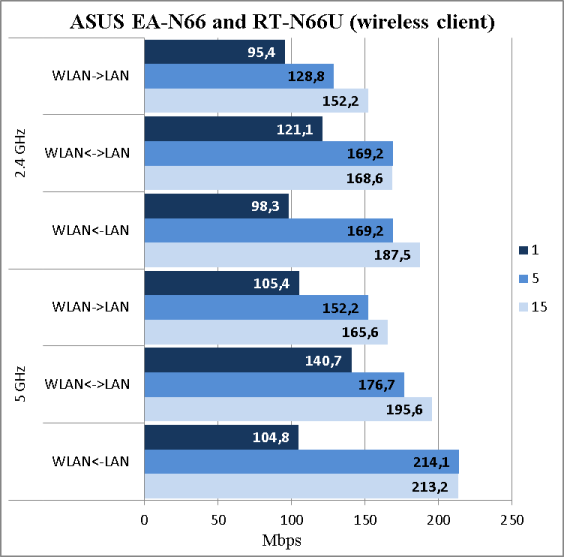 Some more attention should be paid to the fact that EA-N66 can work simultaneously in only one range unlike RT-N66U which lets wireless clients of the range 2.4 GHz as well as 5GHz connect at a time. At the moment of writing the article ASUS EA-N66 wasn’t sold in Russia, that’s why it is too early to speak about the price.